An exponential function of the form f(x) = bx has base b, where b is a real number, b > 0, and b ≠ 1. An exponential growth function is an exponential function where b > 1. 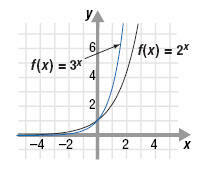 The graph of an exponential growth function increases when moving from left to right. Examples of exponential growth functions are population growth and compound interest earned on money invested. â€¢ Each graph increases when moving from left to right (because b > 1). â€¢ Both graphs intersect the y-axis at (0, 1). â€¢ When x < 0, the graph of the function with the smaller base, y = 2x, lies above the graph of the function with the larger base, y = 3x. â€¢ When x > 0, the graph of the function with the smaller base, y = 2x, lies below the graph of the function with the larger base, y = 3x. â€¢ Each graph passes the vertical and horizontal line tests. Therefore, each graph represents a one-to-one function. â€¢ The domain of each function is all real numbers. â€¢ The range of each function is all positive real numbers.